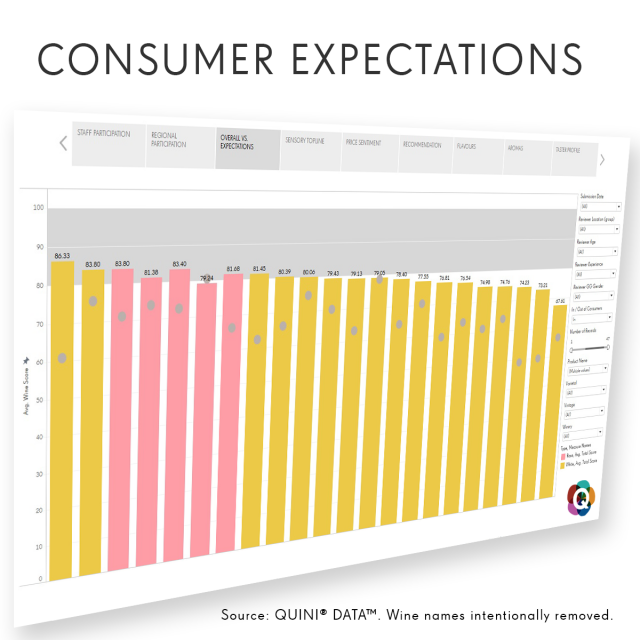 Recently we analyzed twenty two sparkling wines using QUINI ANALYTICS™, to visualize consumer average expectations for the products, compared to their overall ratings. The actionables we uncovered were undisputeable. To put this in context, Quini’s wine tasting and rating sensory and attitudinal data collection application incorporates an Expectations scale. A 0 to 100 slider that records what a taster expects from a wine, prior to tasting it. NONE, LOW, MEDIUM and HIGH options make it easy for users to make a selection. Data-driven wine marketers and winemakers would find this kind of consumer feedback extremely important, for many reasons. Whether people have heard bad or good things about a wine, makes a difference. Expectation also indicates if consumers have not heard of your wine at all. Maybe even that the packaging and brand are doing a great – or terrible job – with that important first impression. Each of these instances spells an opportunity for the marketing or brand manager to take immediate action. Each of these scenarios creates yet another chance to improve things. For example, a wine that far exceeds the average expectation indicated by consumers, suggests that better market awareness, new packaging, or maybe even a different name, should be considered. Otherwise why would a great wine get an average expectation of just 50, 60 or 70 points out of 100? Our data visualization dashboard highlighted a higher end wine called Ferrari. The wine received the highest relative average expectation in its category. Whether that was because of its name, price point, region, or all of the above, is a good question. Often it’s a mix of things that shape expectations. One of the benefits of having an interactive analytics dashboard is that you can drill deeper on the spot, to get the full picture. In this case, we know one thing for certain. As soon as the tasters heard the name Ferrari, the noise volume in the room went up. Before you rush to give your next product a super fancy brand name, it is critical that you ensure the product will meet the perception it will set. Otherwise the move will be counter productive and can backfire. Another scenario is a wine that rates materially low relative to taster expectations. Or one where both expectations and ratings are low. In some cases, such wines may need to be taken back to the drawing board. While the winemakers may not like such feedback, it is very powerful input that if ignored can cost companies millions of dollars in lost revenue, frozen assets and wasted marketing. It can even cause irreversible damage to a brand. A highly rated wine with relatively high consumer expectations might justify a price increase. On the opposite end, a wine that falls short of consumer expectations suggests they may not re-purchase the product frequently or recommend it to others. Therefore, moving this inventory quickly using a price reduction strategy may be the smart thing to do. In this instance, marketers would want to consider taking action without overly promoting the product, to minimize its association with the brand, winery or distributor. A pro-active approach to the opportunities discussed in this article can save wine companies significant time, cash and human resources. A data-driven marketer makes measuring consumer expectations and capturing wine ratings integral to their function. Giant consumer product companies have always relied on consumer research to drive product and marketing decisions. Some of the larger wine producers too have made consumer research central to their operations. Sales data inherently do not answer the ‘why’ consumers buy or do not buy a product. World class, easy-to-use sensory and attitudinal data collection tools and analytics from Quini today enable companies of virtually any size to tap the missing consumer feedback piece that is needed to accurately answer these questions. Do you currently collect consumer expectations data for your brands? How do you leverage that information in your decision making? 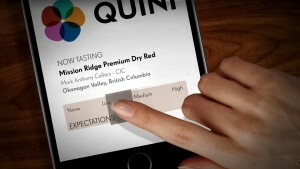 Email us at info@quiniwine.com to schedule a demonstration and start a free trial of QUINI DATA™.